Obituary – Barnes, Ada Faye « Perry High School Alumni Association, Inc.
Ada Faye Barnes passed away February 8, 2004, was born December 19, 1922 to Lee and Dora Barnes on a farm south of Perry, OK. She was the sixth of 10 children. Her parents, Lee and Dora Barnes preceded her in death as well as 4 brothers, Walton, Lawrence, Lee Edwin and Burton Barnes and 3 sisters, Xina Barnes, Wanda Garfield and Arvesta Berry. She is survived by 2 sisters, Naomi Beaman of San Antonio, TX and Nadine Sallee of Pawnee, OK.
Times were difficult and life on the farm was very hard during the Great Depression. She attended several schools in Noble County including Sumner, Lucien and Orlando High Schools, graduating from Perry High School in 1940. She then attended Beauty College in Enid and passed the state boards as a qualified beautician at the head of her class. She worked in Enid, Perry and Stillwater in this field. After the start of World War II she joined the United States Coast Guard as a SPAR. 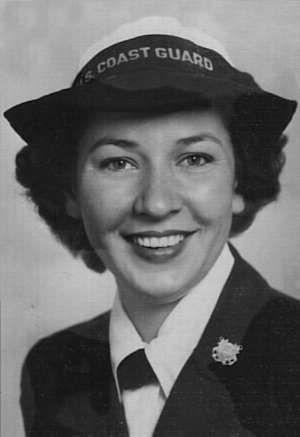 She served her country as a Radio Operator until she was no longer needed. She told her parents that she could not stay home, when all the men were in the service. Following the war she took advantage of the GI Bill to further her education, becoming a Laboratory Technician. She worked in Enid for a while, attending Phillips University, where she obtained her B.S. degree. Faye was a member of Epsilon Sigma Alpha International and kept in close contact over the years with her sorority sisters. She was offered a job at Springer Clinic in Tulsa where she became head of the lab before she retired in 1987. Since that time she served as a volunteer for many organizations, among them were the Community Action Project and working as a volunteer for St. John Hospital which she continued until she entered the Hospital for her final surgery. She had traveled to nearly every country in the world, some of them several times. She was a member of the Harvard Avenue Christian Church and had been a Christian since she was teenager, being sure to find a church wherever she went. She was a very devout and thoughtful person. Of her many accomplishments perhaps Faye’s greatest achievement was in the example she set for her 9 nieces and 13 nephews. She was known as “Aunt Faye” to many, many people who were not related to her in any way. She felt at home at the Roberts family reunion, the Beaman family reunion and the Sallee family reunion. She was fond of taking her nieces and/or nephews on trips and vacations. She saw to it that they were introduced to good entertainment and wholesome recreation. She provided them with opportunities that were educational and fun, which they would not otherwise have had available to them. Not only her relatives, but also their friends benefitted from Faye’s generosity. Often she had nearly a dozen kids at a time, sometimes with their parents and sometimes alone. Although she never married nor had children of her own, her 22 nieces and nephews considered her a very vital part of their lives as did the numerous great-nephews and great-nieces. The stories are endless. No family gathering was complete without her presence. She also leaves many, many friends. The family asks that instead of floral remembrances donations be made to the Oklahoma State University Center for Health Sciences, Attention Renee Motte. Memorial service will be held at the Harvard Avenue Christian Church at 2 p.m., Friday, February 13, 2004. Ninde Funeral Directors, Garden Chapel, 742-5556.